Miami Dolphins Suspend Richie Incognito Over Slurs, Threats Directed At Teammate : The Two-Way Veteran guard Richie Incognito is alleged to have left intimidating messages and texts on the phone of second-year offensive tackle Jonathan Martin, who left the team last week. The NFL and the Dolphins have transcripts of some of the messages. 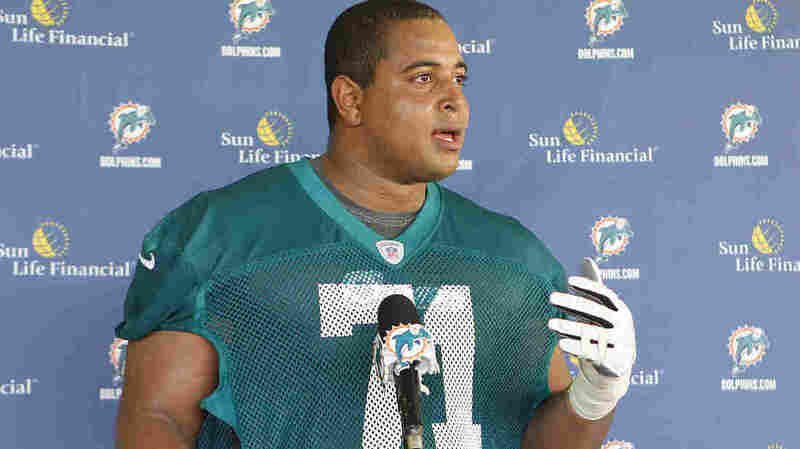 Jonathan Martin, seen here during an NFL rookies' camp in 2012, allegedly received threatening texts and voice mails from teammate Richie Incognito that included racial slurs. The Miami Dolphins have suspended a veteran player indefinitely, after he allegedly sent threatening messages that included racial slurs to a younger teammate. The NFL is investigating what is being called a case of hazing and harassment. Veteran guard Richie Incognito is alleged to have left intimidating messages and texts on the phone of second-year offensive tackle Jonathan Martin, who left the team last week. The Dolphins had not previously provided details to explain Martin's absence. As for Incognito, "He's done" in Miami, a source tells The Miami Herald. The source continued, "There are procedures in place and everyone wants to be fair. The NFL is involved. But from a club perspective he'll never play another game here." Martin, a Stanford graduate who was a second-round pick by the Dolphins in the 2012 NFL draft, is the son of two lawyers. He was a classics major at Stanford, according to NPR's Mike Pesca, who adds that Martin also considered Harvard, where he would have been the first ever fourth-generation African-American at the school. But at the Miami Dolphins' facilities, Martin was called "big weirdo" — a moment from last year's training camp that was chronicled on HBO's Hard Knocks NFL show. Transcripts circulating today show that he was called far worse names more recently, as Incognito reportedly used slurs referring to Martin, who is biracial. "Martin left Dolphins headquarters [last] Monday when finally reaching his limit with the persistent bullying and teasing from some teammates that has plagued him since joining Miami," reports Fox Sports. The network says Martin left the team after "a group of players stood up and left when he tried joining them for lunch." After leaving Miami, Martin went home to California to be with his family. According to Fox Sports reporter Mike Garafalo, Martin remained in California today. "Martin shared texts and voice mails with his parents on Saturday, and turned them over Sunday to the Dolphins and the league, according to sources close to Martin and involved in the investigation," NFL News reports. "The evidence implicates Incognito and, to a lesser extent, Dolphins center Mike Pouncey. A transcript of a voice mail that has been circulating Monday describes an offensive and expletive-laden message, allegedly from Incognito. It also uses a racial slur and threatens violence. The NFL and Dolphins have heard the voice mail, according to NFL News. The issue has been a hot topic, as NPR's Mike Pesca tells Melissa Block on Monday's All Things Considered. And the discussion has grown more serious as details have emerged. "Today, the revelation of these texts and more details about what actually happened changes this [from] a discussion of if a large person can be bullied, to where we are now, which is real harassment, possibly criminal," Mike says. "The broader issue is hazing in the NFL," Mike says. "Hazing goes on in the NFL much more so than it does in a lot of other institutions." Mike says that the NFL is a private enterprise where hazing is often seen as harmless — but it generally means "rookies have to carry equipment; sometimes rookies are made to pay very large bills when the veterans go out to eat," he says. The Miami Herald reports that if Martin was the target of hazing, he wasn't alone. "Incognito pressured Martin into paying $15,000 for an unofficial team vacation to Las Vegas – a trip that Martin didn't even join," the newspaper says. "One young defensive player, whose privacy the Miami Herald is protecting, is on his way to going broke because he has been unable to say no to the older players, a source said." As for what punishment the NFL might dole out if the current allegations are proven, Mike says, "The commissioner, Roger Goodell, has leveled heavy fines and heavy suspensions for things that embarrass the league. It's not hard to think that Roger Goodell will act up on this very fiercely." On Sunday afternoon, the Dolphins said in a statement, "We received notification today from Jonathan's representation about allegations of player misconduct. We are taking these allegations very seriously and plan to review the matter further." The team said it had contacted the NFL about the allegations. That message contrasted with the tone of a Dolphins statement issued earlier on Sunday in which the team said, "The notion of bullying is based on speculation and has not been presented to us as a concern from Jonathan or anyone else internally."